Feel like the work floor finds its way into your work shoes no matter how much you tiptoe around the messes? Extend your barrier with the long coverage of Chippewa Men's 23913 Leather Vipercloth Cloth American-Made Snake Boots. 17 inches long, the uppers of the ... (see full details) (see specifications) #CHP23913. Feel like the work floor finds its way into your work shoes no matter how much you tiptoe around the messes? Extend your barrier with the long coverage of Chippewa Men's 23913 Leather Vipercloth Cloth American-Made Snake Boots. 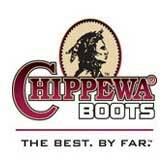 17 inches long, the uppers of the Chippewa boots keeps you from being exposed. Made with oro-russett and espresso-colored Vipercloth, the uppers are extra sturdy. The men's boots feature a leather lining for added durability and a smooth fit. The bottom area of the uppers are made with rich brown leather and feature buckles to help you customize the fit. There are also buckle closures at the tops of the USA-made boots, so you can adjust them to your personal preference. Triple-ribbed steel shanks and 4 iron rubber midsoles provide you with stability at work, at home, and wherever you feel like wearing this Chippewa footwear. The extra reinforcement, along with the tall height, makes for a great pair of American-made boots. They'll give you the coverage you need, whenever you need it. 5 iron Texon insoles offer a comfortable interior. The Vibram Gumlite outsoles of the leather boots feature a honeycomb pattern to give you excellent traction and stability. Micro-cellular technology delivers the abrasion- and slip-resistance of rubber, but with half the weight. The result includes safe, durable outsoles that won't weigh you down. Stay covered and stable from the bottom of your feet to new heights with these Chippewa Men's 23913 Cloth Boots. Get yours today! They're available at Working Person's Store, and they are handcrafted in the United States. First I ordered a size 10 because that is what size I wear. They were too big. Because I'd ordered another pair of boots from Chippewa 15 years ago that were size 9.5 I returned them (return was easy smooth, and A+!) and asked for size 9.5. The right boot seems to be larger than left boot, but I am keeping them, and have added cushion inserts to make them fit better. Great looking boots, but the fatal flaw of not having lacing results in a loose fit no matter what the size. This would only be magnified after breaking them in as there would be no way to tighten the fit. The strap across the top of the foot does nothing to adjust the fit and is mainly for loosening the boot to get them on or off. If you want to look good and plan on walking around the yard, these might work, but if you plan on hiking or working with these, your feet will not be happy. Got snakes? These boots are made for you. Super thick boots stop all but the most powerfull poisonus bites. Top quality construction. Rugged enugh for the deep bush, yet stylish enugh for your next western formal event. Why pay more? Why sacrifice an ounce of protection. Nice and warm, long march comfortable! Great fit & style & comfort. Chippewa is the best! Have several other of their boot styles and never an issue with any of them. I only wish they made a few more styles, like men's tall harness boots in addition to the engineer styles. Just wanted to let you know I've received my boots and they are a great fit. I've been wearing them for three days, and the break-in period has been uneventful. Thanks for the quick and smooth service. This is the only boot I will wear from now on. Chippewa Boots: Men's USA-Made 17 Inch 23913 Vipercloth Lined Work Boots is being added to your cart.